Rajeev's World: నమస్కారం రాజమండ్రి - Namaskaram Rajahmundry! నమస్కారం రాజమండ్రి - Namaskaram Rajahmundry! 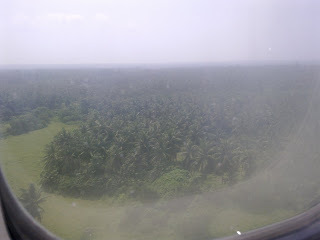 About two weeks back, I travelled to Rajahmundry on the eastern coast of India. Strategically located on the banks of the banks of the mighty Godavari river and the city is base for India's future energy security - it's the principal city providing logistical support to India's offshore gasfields located in the Krishna-Godavari basin. 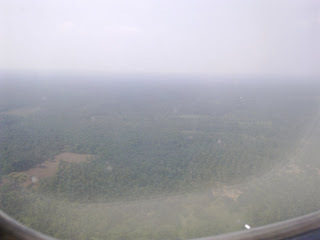 As our Kingfisher Airlines ATR72-500 turboprop descended towards Rajahmundry's tiny airport, we hit an air-pocket and I was jolted out of my snooze mode. What I was wonderous - the mighty Godavari and magnificently long bridges spanning the width of the river. 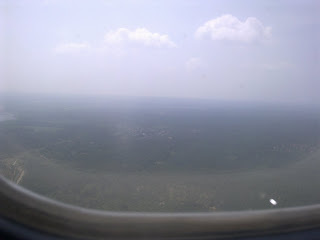 It took me a while to start clicking on my camera phone, obviously it was in airplane mode. 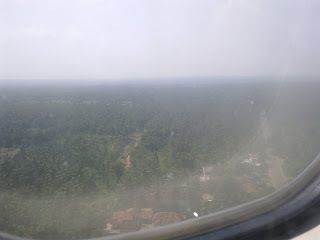 When I did start clicking, all I could see was endless stretches of enchanting greens and coconut groves, something that places like Kerala are fast losing. We had a bumpy landing and the ATR72-500 taxied noisily, with its characteristic sound (which is undoubtedly so retro), towards the terminal building. 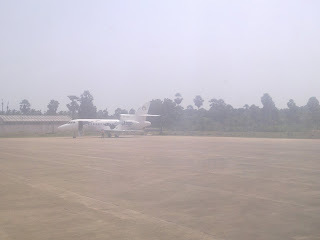 There was a private jet - Reliance Industries' Dassault Falcon 900EX with a VT-AKU designator neatly parked in tiny bay. The company operates flights between Bombay and Rajahmundry on a daily basis ferrying executives and engineers to their gasfields in the Krishna-Godavari basin. The terminal building was tiny - no conveyor belts(!) - baggage was brought out in tractor trolleys. Despite the lack of amenities, the emergence of air connectivity has brought about a change. Hyderabad is no longer an overnight train ride, its just 45 minutes away, with easy connectivity to the rest of India, and of course the world. 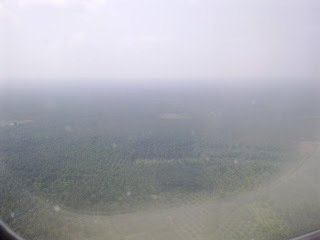 The flight was full, proving the potential, but there is more potential to connect other parts of our country. 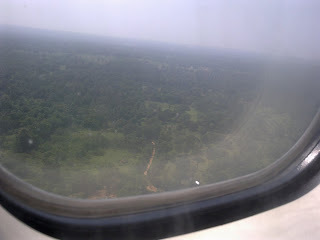 As we drove out of the airport terminal towards the city, the greenery looked even more inviting. If tourism were to develop in these parts, coastal Andhra could give Kerala and Goa a good run for their money. After a few visits and meetings, it was time to break for food. There was an amazing array of spicy sambhars, rasams, fiery chicken curry and succulent freshwater prawns, all in true spicy Andhra style. Coming from Bombay, where we are used to sea-water prawns, the freshwater prawns here were different - incredibly sweet, when compared. This was a welcome change - the sweetness of the prawns blended well with the fieriness of the green chilly gravy! Despite being a full-bloodied North Indian, I would concede that spicy Andhra food is best enjoyed with steamed rice! And to top it all, there was a thick green, sour and spicy, gongura chutney that went very well with the rice. Curd rice brings every South Indian meal to a fitting end and as I was enjoying the curd rice, I was offered a sweet called Sunnundalu - dark brown balls, which were absolutely heavenly. I was later told that the sunnundalu prepared along the Andhra coast has jaggery as an ingredient, which gives it a dark brown colour, whereas the rest of Andhra uses sugar, giving it a lighter texture. By then the day was almost over and it was time to retire to my hotel room, but I was fixated on one thing - getting a big box of sunnundalu to take back home. 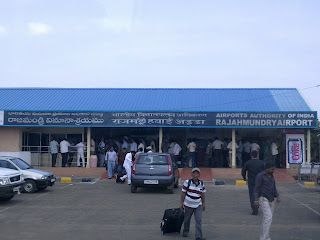 Next morning we had a flight at 11 back to Hyderabad, but markets in Rajahmundry only open at a leisurely pace, so it became Mission Sunnundalu for Hyderabad! 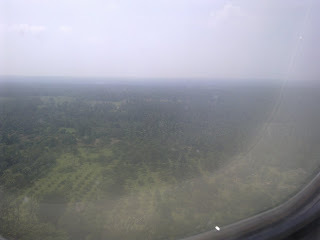 I had a 6 hour stopover at Hyderabad with two meetings scheduled. In between two meetings, I was directed to G. Pullareddy Sweets at Begumpet, where I did get my pack of treasured sunnundalus! Though these sunnundalus were half as good as those I had at Rajahmundry, they did last me long enough till now, as worthy accompaniments to my bedtime cup of tea! Rajahmundry is one of those many offbeat gems that India has which are unknown, but with unlimited sights that please the soul, with delectable cuisine that can fire up your excitement and what not! I wish places like these prosper with sustainable tourism unlike what we have seen in Goa or in Kerala! The Arty Café, Earthy Food & Caife Gaelach!